Today’s companies and organizations generate and store massive amounts of data. How can you use that data to make informed business decisions? Participants in this hands-on two-day executive education program will find out. Registration deadline: November 5, 2015. 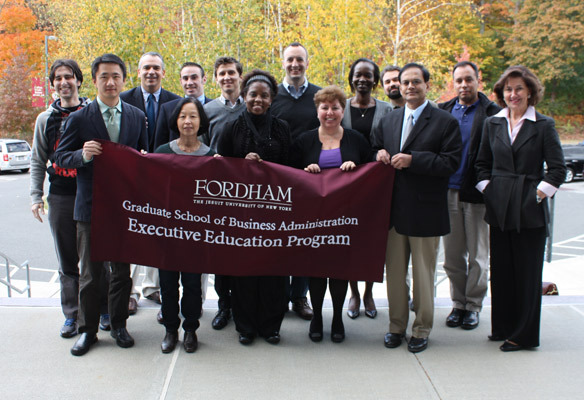 Today’s business paradigm requires that professionals and executives not only understand how to analyze large amounts of data but also make informed decisions and capitalize on its meaningful trends.With this environment in place, this two-day course, sponsored by Fordham’s Executive Education and the Center for Digital Transformation, examines the strategic and transformational applications of advanced business analytics. The models, methods, and tools needed to leverage corporate data to predict and enhance executive decision making are introduced and the opportunities and challenges discussed. $1,995* (Price includes all academic materials plus breakfast and lunch). *Reduced price available for Fordham Alumni, call for information. The Big Data explosion due to social media and rapidly growing number of mobile devices & smart phones is challenging business leaders (CEOs, CIOs, CTOs and others) to discover new ways to simplify IT operations and support revenue generating services and applications. This one day workshop, sponsored by Fordham’s Executive Education and the Center for Digital Transformation, examines the strategic and transformational applications of cloud computing. The models, methods, and tools needed to leverage cloud computing in today’s corporate environment as a value proposition will be highlighted. $295 (Price includes all academic materials plus breakfast and lunch).